We began Thursday with a fresh fruit smoothie, which has become our habit, and packed up the car and headed out. 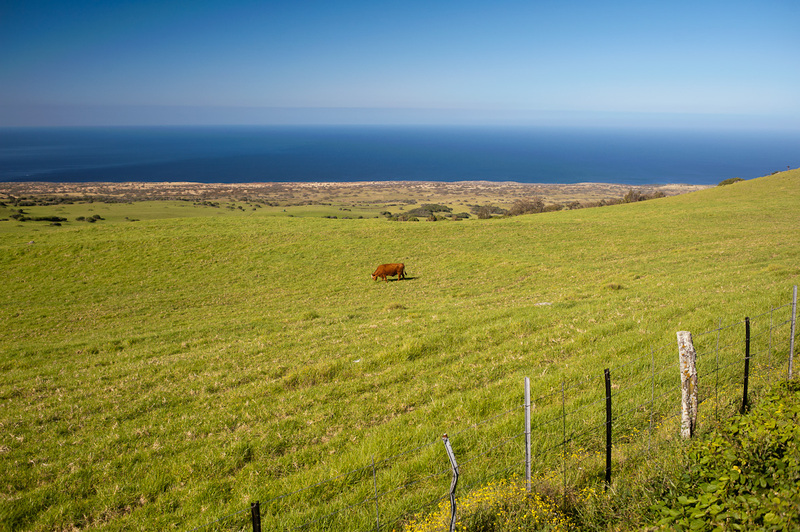 From Hawi, we turned south onto the Kohala Mountain road through verdant ranchlands and up 3500 feet, dropping after 21 miles into Waimea. From Wiamea, the Belt Road took us along the northwestern coast across many bridges to Hilo. 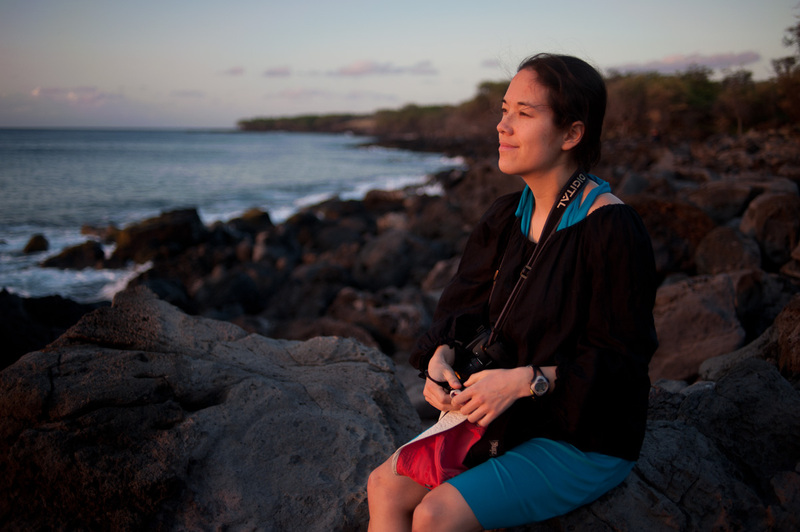 I took an immediate liking to Hilo. 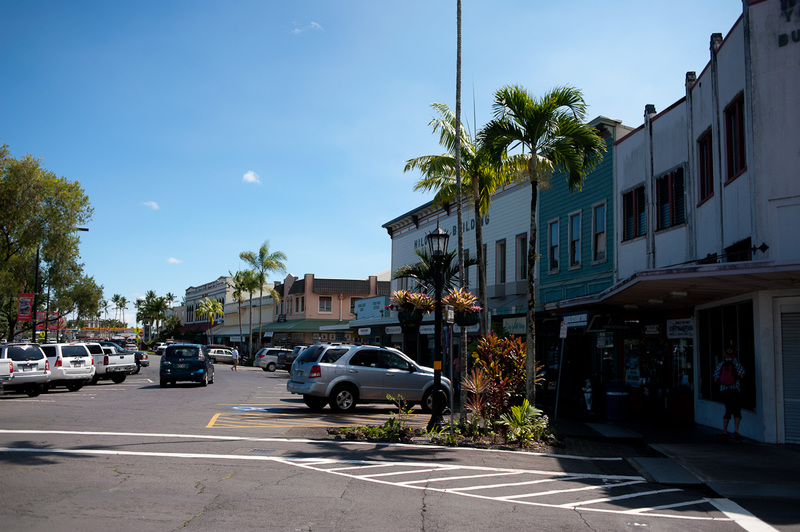 Once the centre of the now-defunct sugar cane industry, Hilo has a worn and sleepy attractiveness to it. 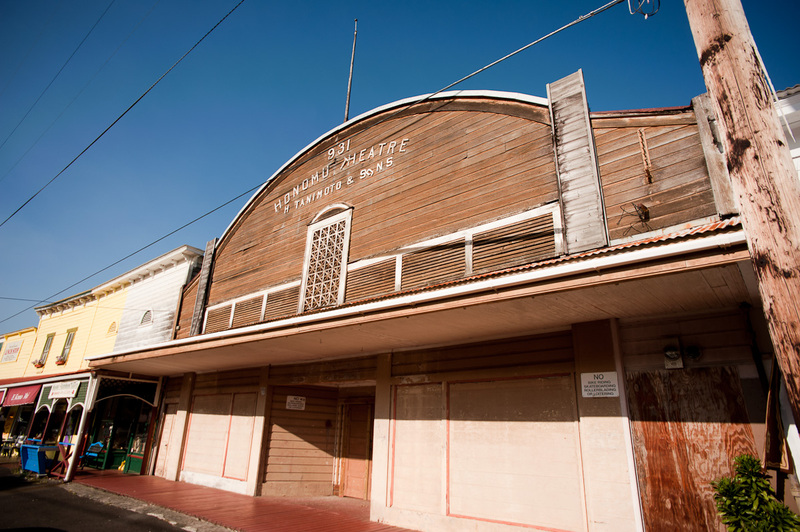 The narrow downtown streets are lined with low wooden buildings with great shopfronts, and the signs reflect the Japanese-Hawaiian-American culture that has evolved there. 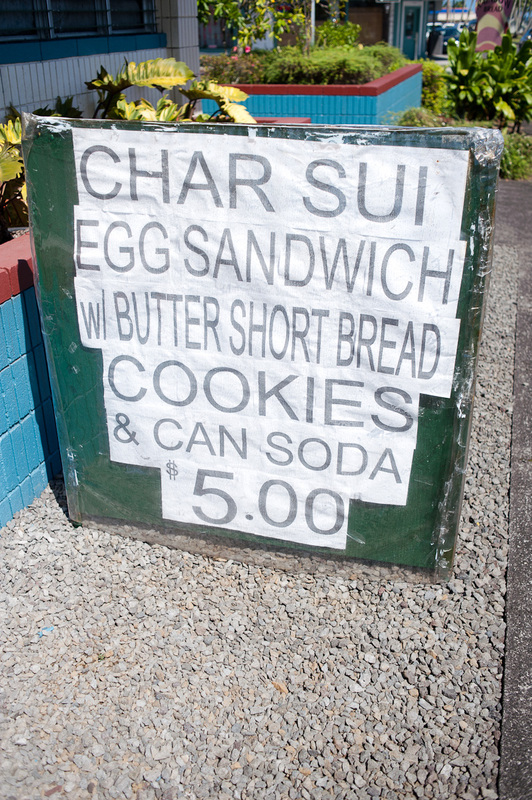 Bento and musubi are for sale in many of the local restaurants, along with loco moco, a dish of rice, a burger patty smothered in gravy, and an egg on top. We stocked up on mochi, the Japanese sticky rice dessert, at Two Ladies Kitchen. We had lunch at a Miyo’s, which serves up traditional Japanese dishes in a teahouse-like setting overlooking the Waiakea pond. 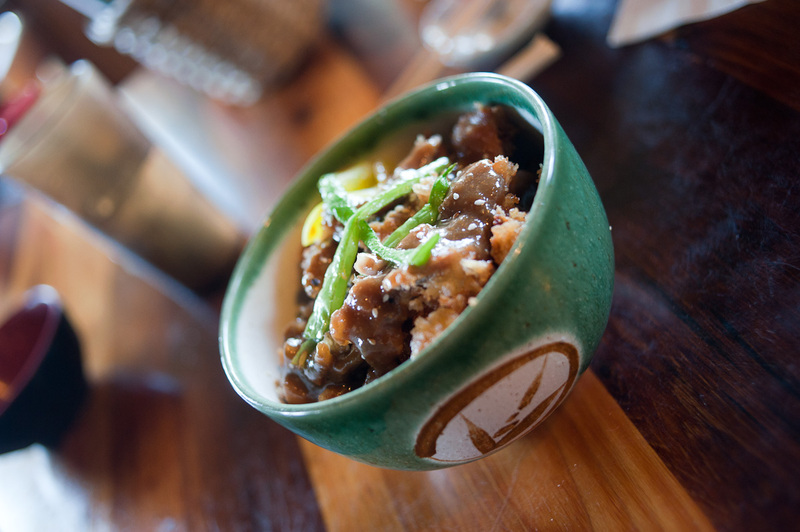 Located in what seemed a derelict resort, Miyo’s was busy, basic, tasty and fun. I had a sesame chicken don. Volcanoes National Park is a short 45 minutes drive away. Just inside the park, we stopped at the visitor centre and found out, alas, that the lava isn’t visibly flowing at this time. Nevermind, there was still tons to see. 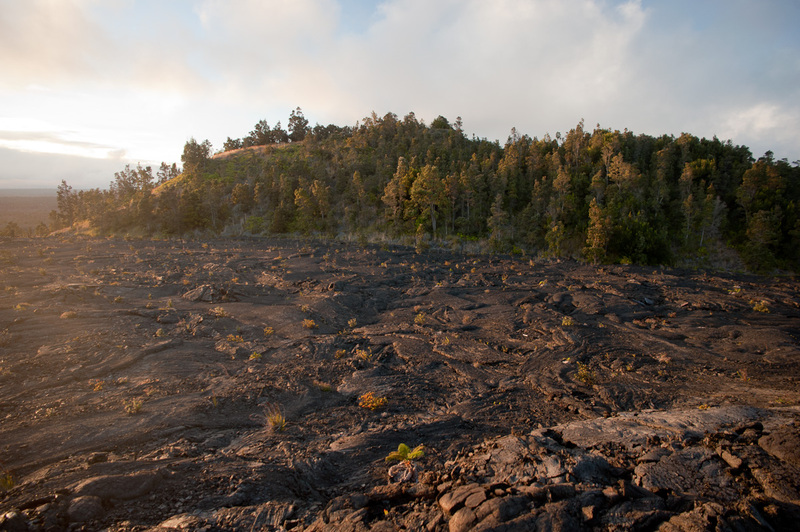 We started with a 2km walk around Kipukapualulu, a 4,000 year old island of closed-canopy forest that has survived the lava and is home to a rich assortment of birds and rare trees. 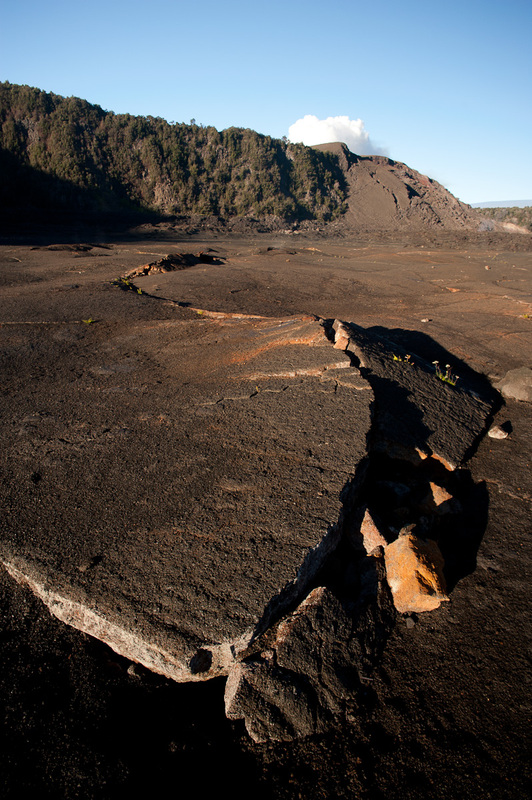 The highlight was an end-of-day hike to the Pu’u Huluhulu Cinder Cone and the Mauna Ulu shield. Stopping en route at a couple of massive pit craters, we arrived at the trailhead which was originally part of the Chain of Craters Highway until lava flows in the early 1970s smothered it. 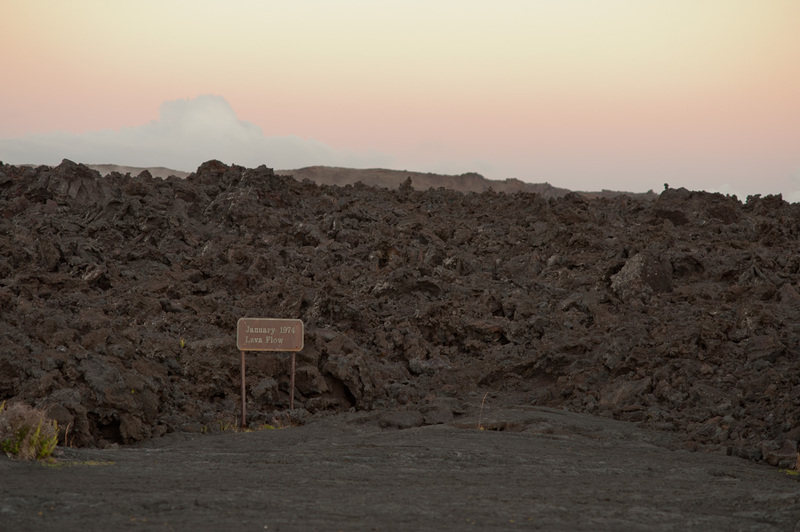 We parked the car at around 4:30 and headed east across quite barren flows of ropey pahoehoe lava. The warm, low light brought out wonderful details in the landscape. The cinder cone itself is forested; older than the landscape around it, it seems to have been protected. 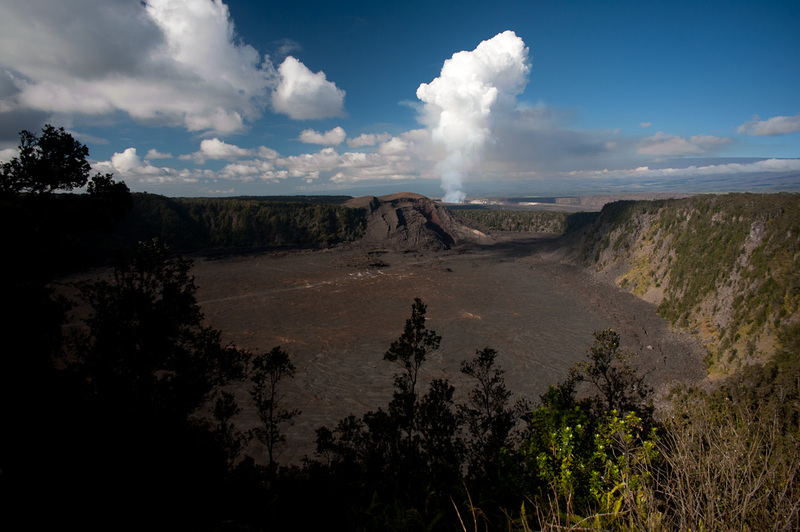 We hiked around the cone, then climbed up towards the steaming Mauna Ulu crater. 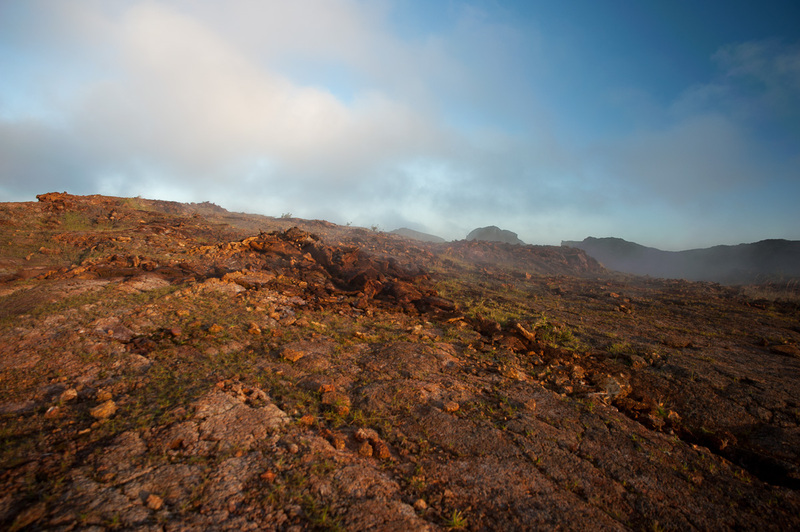 The landscape here was lunar, with only a few small ferns and bushes poking through the lava. 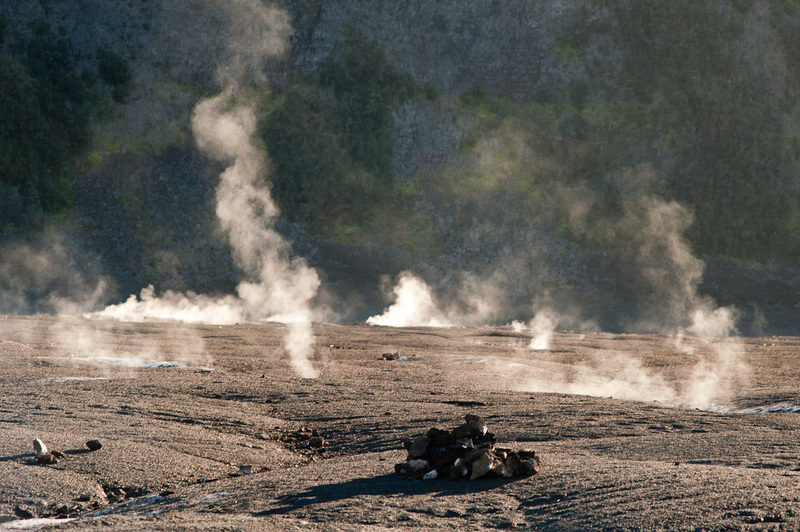 Closer to the crater’s edge, steam issued from fissures. With the sun close to the horizon, it was very atmospheric and impressive. The hike back into the setting sun was quite lovely. Driving back towards the entrance of the park, we stopped in the Thurston Lava Tube. The darkness outside didn’t matter for a walk through the 500′ long, lit tube. We drove around the crater to the Jagger Museum’s viewpoint over the enormous Kilauea Crater. 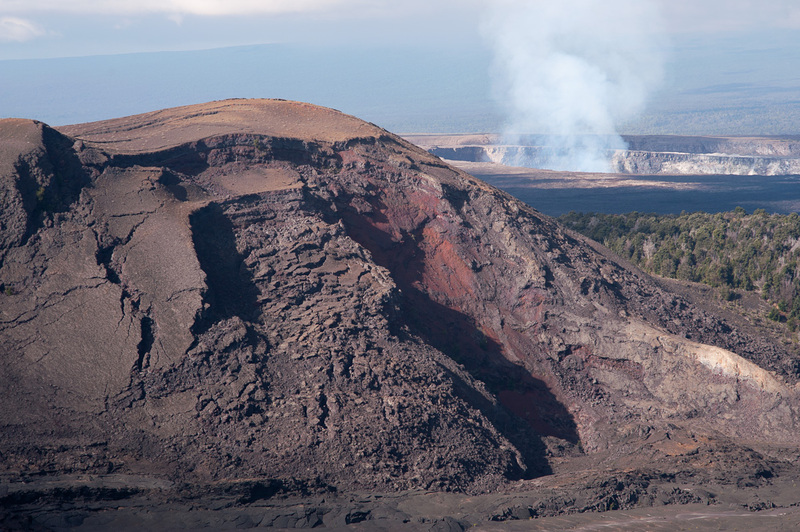 A crater within it, the Halema’uma’u, is currently very active, and at night is a massive orange-glowing furnace emitting copious quantities of steam high into the atmosphere. It was pretty thrilling to see. We spent the night in the very-nearby town of Volcano (I’m not sure who would want to invest in real estate on top of an active volcano). 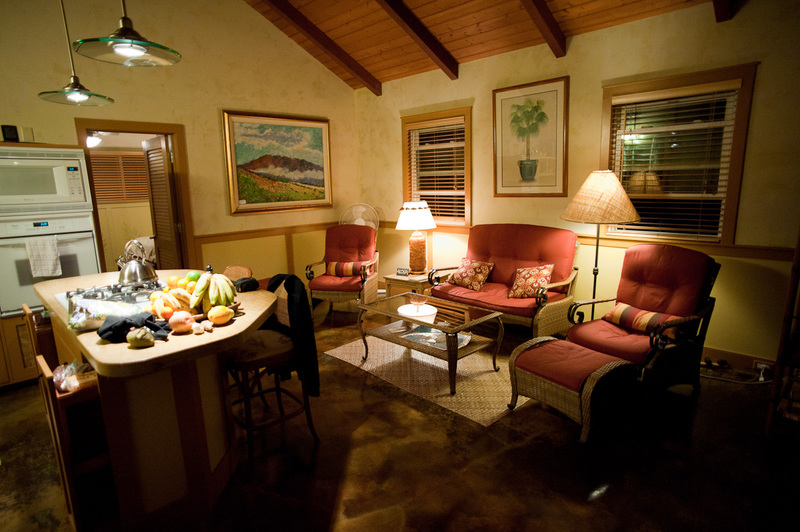 Our guest house was simple and comfortable. 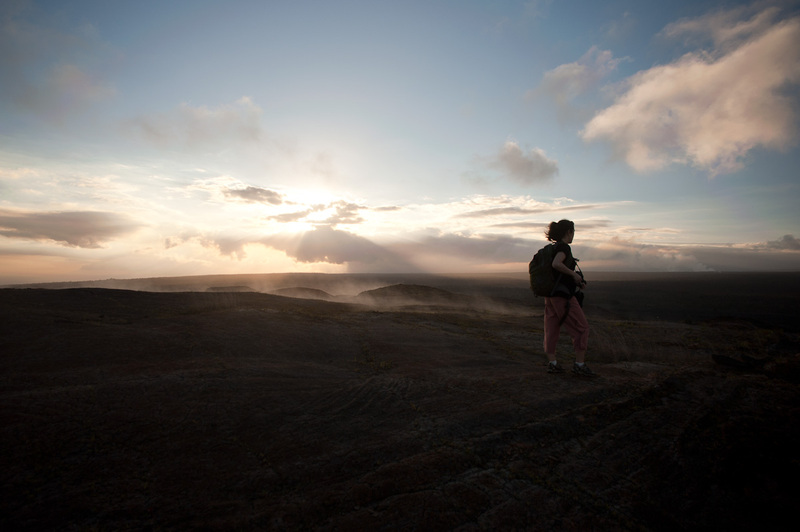 We weren’t there for long – we went to bed at 9pm and woke at 6am to make the best of an early morning hike. At 6:30am, we parked next to the Kilauea Iki crater. 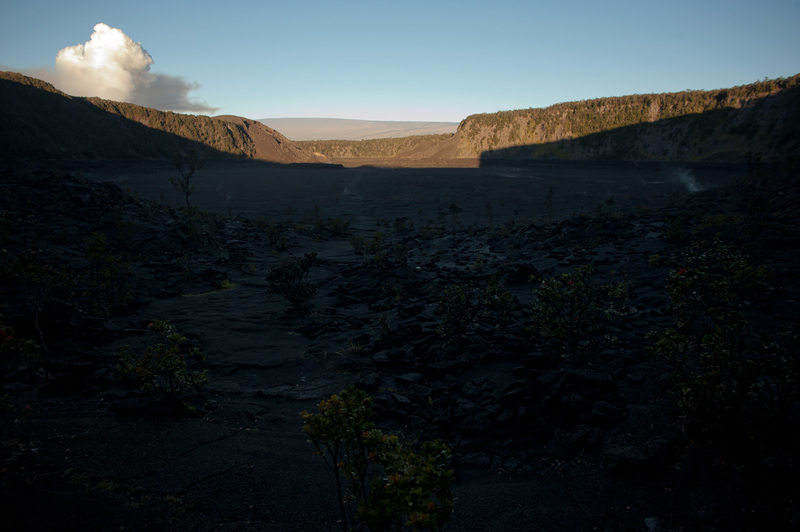 In 1959, this crater erupted, firing lava as high as 1,900′ in the air and creating an enormous lake of molten rock that took 30 years to solidify. Our hike took us down into the crater, along the crater’s floor and up the other side. We were the first to arrive in the parking lot and were treated to an amazing symphony of bird songs as we looked down at the first light hitting the crater floor. We took the trail clockwise, dropping quite quickly down a series of switchbacks, then out onto the flat expanse of the crater. With the rising sun behind us, we set out across the floor, with steam rising out of cracks around us. Near the far side, we came to the actual cone and crater the lava spewed out of. Looking way up to the summit of the cone about 500′ above us, I recalled the photos from 1959 of the molten lava launched several times higher than the cone. The ground became rougher and more broken due to its proximity to the cone. We made our way over it, then began a steady climb up through forest back towards the car. Viewpoints along the way provided great views of where we’d been. On the way out of the park, we stopped at the roadside steam vents and got steamed. We arrived back in Hilo in the late morning. We strolled around the streets, enjoying the clear blue skies, warm temperatures, and funky little shops. Amazingly we ran into two people we know from Vancouver, Keltie and Paul, coming out of the Salvation Army thrift shop with two boogie boards. Small world. After the initial surprise, we chatted and shared what we were up to on the Big Island, said goodbye and headed on in different directions. Kristi and I had good sushi for lunch at Ocean Sushi. I particularly liked my ahi poke roll. 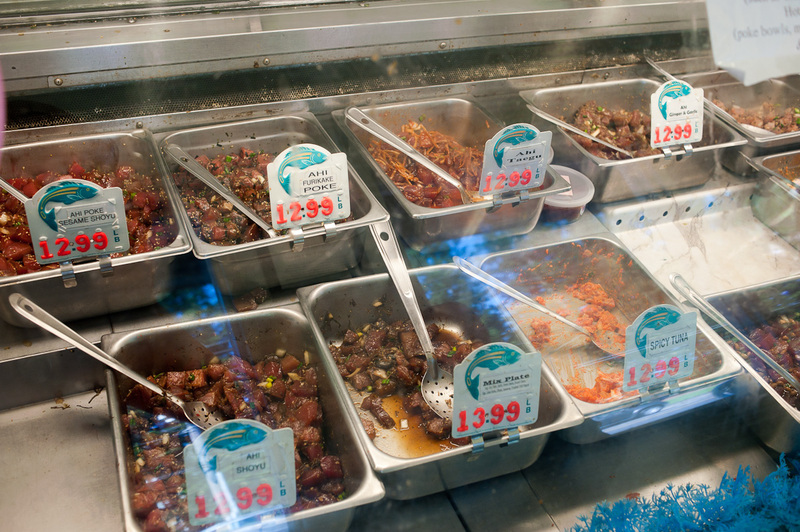 Poke is raw fish, usually ahi, marinated in a shoyo-sesame sauce, and is a staple in Hawaii. 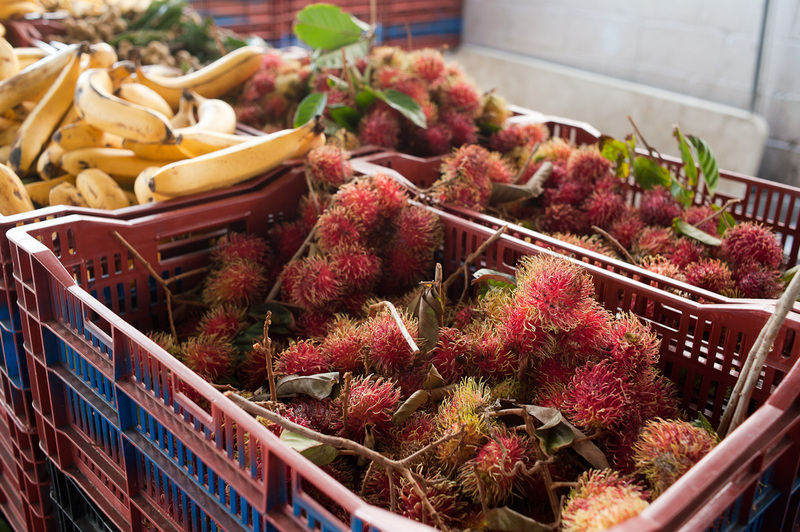 On the way back to the car, we stopped at the small farmers market (the huge one is on Saturdays, unfortunately) and picked up four papayas (for $1), a pineapple, tomatoes and rambutans. Everything came to $8, I think. I also stopped in a small snack shop for a musubi to go. 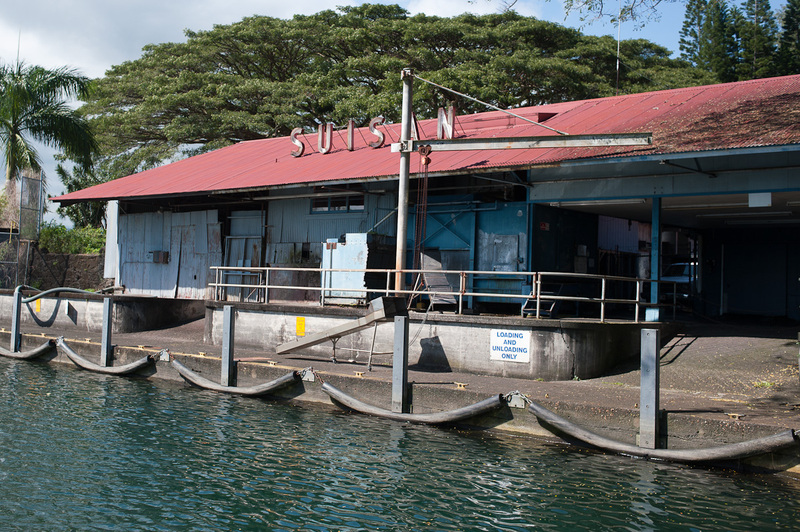 Our final stop in Hilo was the Suisan Fish Market on the waterfront, where we picked up half a pound of poke, which we put on ice for our dinner. A park across the road had a nice Japanese garden and huge banyans. We took more time diving back than on the way down. We dropped off the highway in a couple of places to drive on more scenic routes, stopping at one point to walk down to a rocky cove and watch breakers roll in. 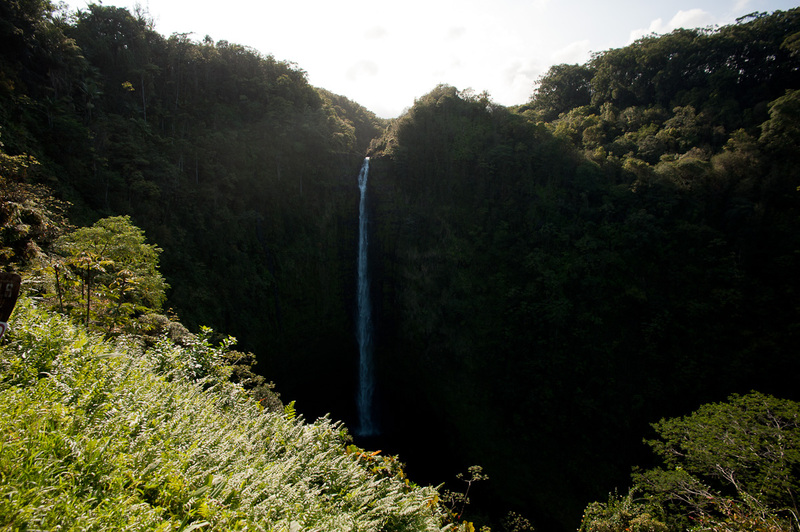 Driving uphill from the highway near Hononu brought us to Akaka Falls State Park. We took the slightly longer walk to the falls through lush forest, then were treated to the falls themselves, dropping straight down 420′ into a fern-filled basin. 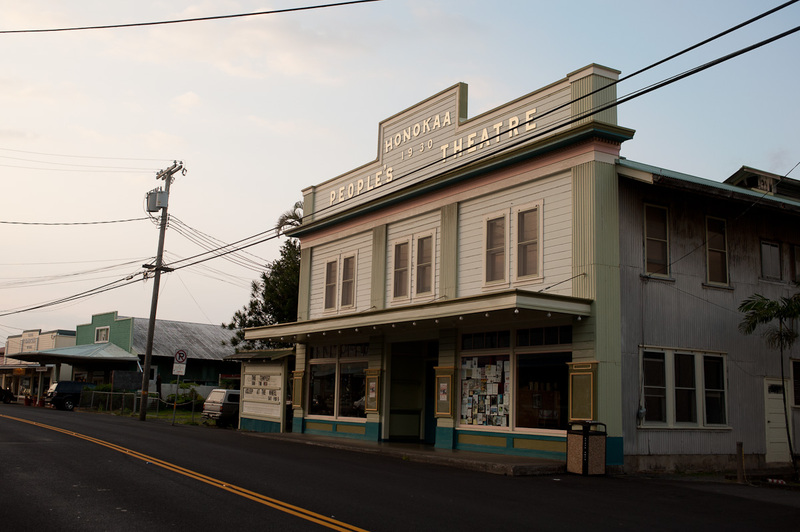 The town of Honomu was pretty attractive too, with its typical strip of old wooden storefronts, and a great old theatre, unfortunately closed. 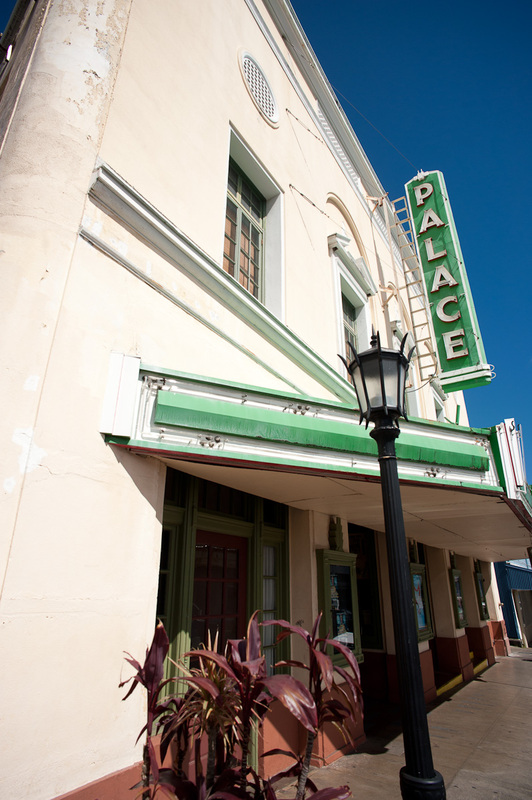 Every small town seems to have a classic old theatre, some functioning, others defunct. Our final stop on that coast was the Waipi’o Valley. We only experienced it from the viewpoint, but it was still stunning, looking down on the valley floor far below and the massive cliff faces on the coast receding into the distance. 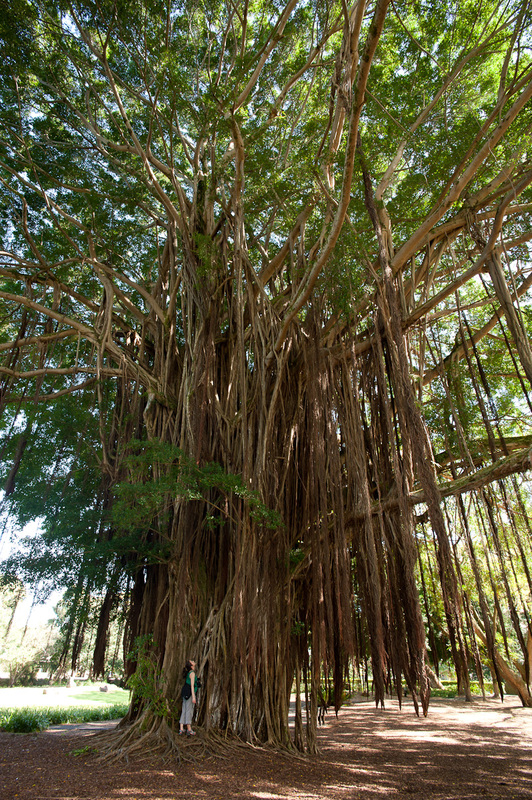 The valley has an ancient history as a centre of taro cultivation for Hawaiians. It is possible to hike down into the valley, up the other side, across several smaller valleys an into a larger valley beyond where you can camp. What a trip that would be. I jumped out of the car for a few minutes in Honoka’a, the lively local town near the Waipo, for a few photos of the old centre of town. 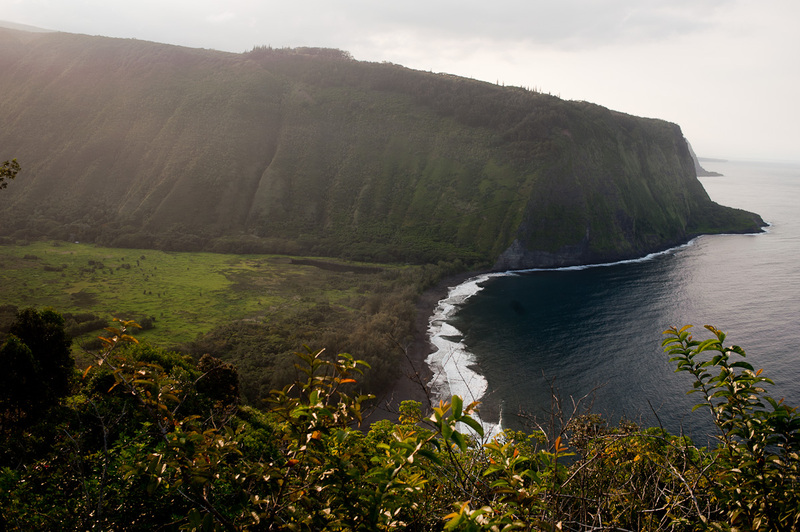 The drive back followed the same route and we dropped down off of the Kohala Mountain Highway at dusk. It felt good to pull up back at the cottage. For dinner, I threw the poke on skewers and made tuna tataki, which was quite delicious. We did three different activities on three different beaches. First up was snorkeling at Kahalu’u beach south of Kailua. 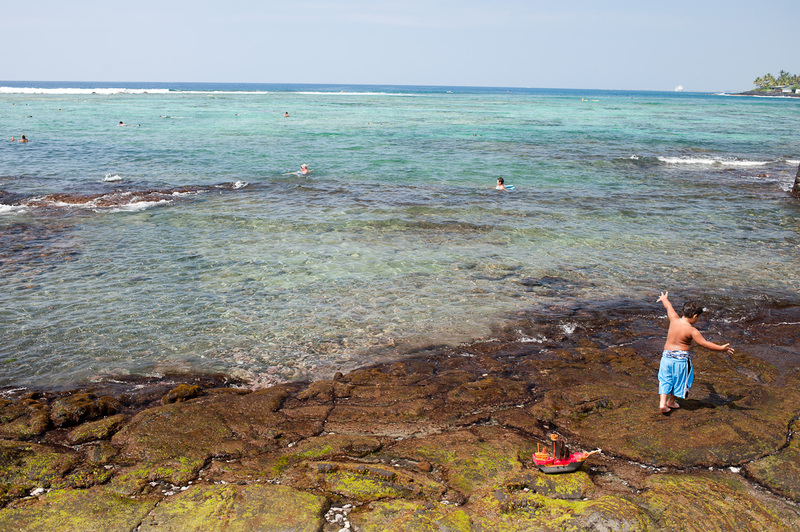 In the midst of the Kona Coast scene, and fairly jammed with snorkelers, it offered surprisingly good snorkeling behind an ancient breakwater. The water was very shallow, sometimes too shallow, but the fish were plentiful and we saw many of the same species as earlier, plus a unicorn fish and a sea turtle. All were amazingly relaxed around the larger number of people. Just beyond the breakwater surfers rode pretty substantial waves. On the other side of an adjacent resort were temple ruins and large tide pools which we strolled around. 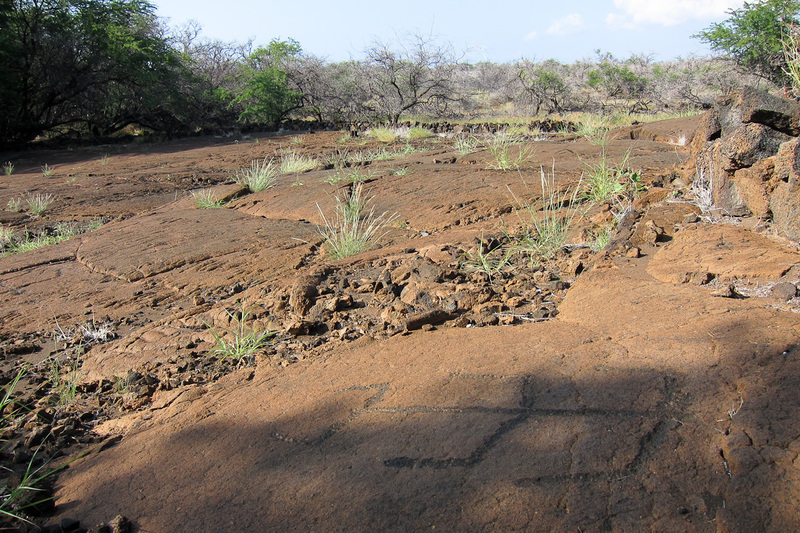 We drove back north through, and after some ugly detours through enormous resort communities on the coast, we arrived at the Puako Petroglyph Preserve. A 1.5km walk through dusty scrub and trees bring you to a large slab of rock that has been carved with 3000 petroglyphs, some human, some animal, some seemingly abstract. We arrived with the light at a pretty decent angle to bring out the details. 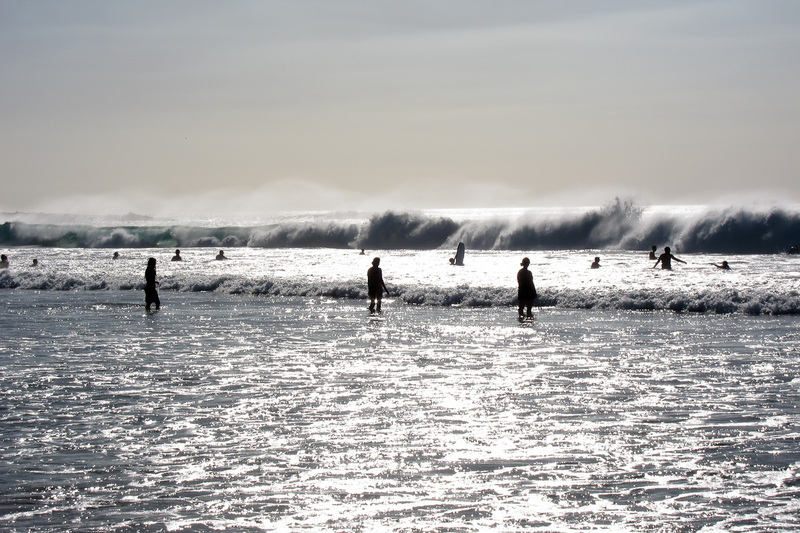 Next stop was a return to Hapuna Beach in the mid-to-late afternoon for some great boogie boarding, with some sizable waves. As it was my first time, I watch those around me for tips and picked up the hang of it pretty quickly. Kristi, sadly, just waded and sat on the beach; she would have loved to have been out in the big surf. Back at the cottage we cooked up a pasta dinner and packed up our stuff for a two-day trip to the volcanoes. The last beach of the day was Kapa’a, not too far from Hawaii, where we sat on the rocks and watched a classic Hawaiian sunset while the locals had a big BBQ. 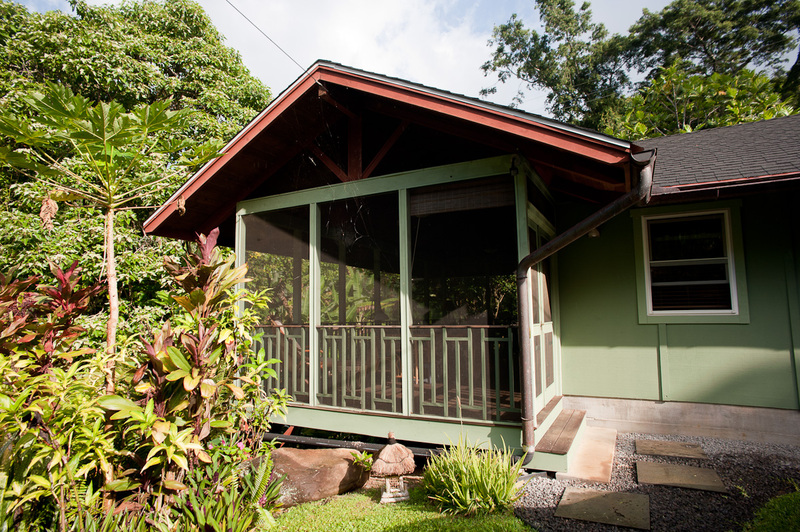 It is the third day of our trip and I am on the screened lanai of our cottage near the lush north end of the Big Island of Hawaii. 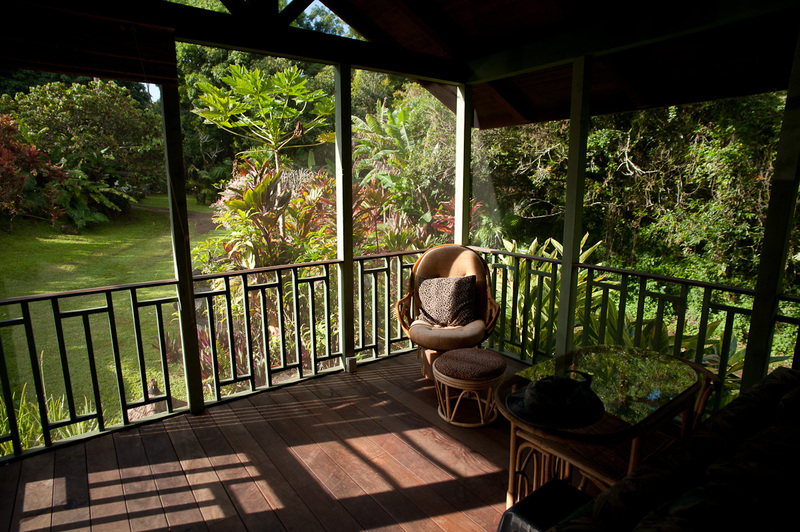 Our place is in a ravine next to an ephemeral stream and surrounded by fruit trees – orange, lime, banana, breadfruit – and an avocado tree. It’s as jungle-like a setting as I’ve been since I was in Borneo, albeit about 10 degrees cooler (still warm). Green geckos with ruby highlights and ebony eyes peer down from the ceiling, and the trees echo with bird calls and whirr with the sound of cicadas. We flew out of the small and functional Bellingham airport on Sunday late afternoon, the cold damp wind chilling us as we walked across the tarmac to the plane alongside dozens of other Canadians fleeing the grey gloom (actually Sunday was a lovely day). The flight, as one hopes it will be, was uneventful, and we were treated to syrupy maitais as we got close to Honolulu..
We stayed a brief night in Honolulu at a Best Western five minutes from the airport. We woke at 4am in order to catch our 5:52am flight to Kona. The short flight was entirely in the dark, but dawn arrived as we waited for our bag in the primarily-outdoor airport. 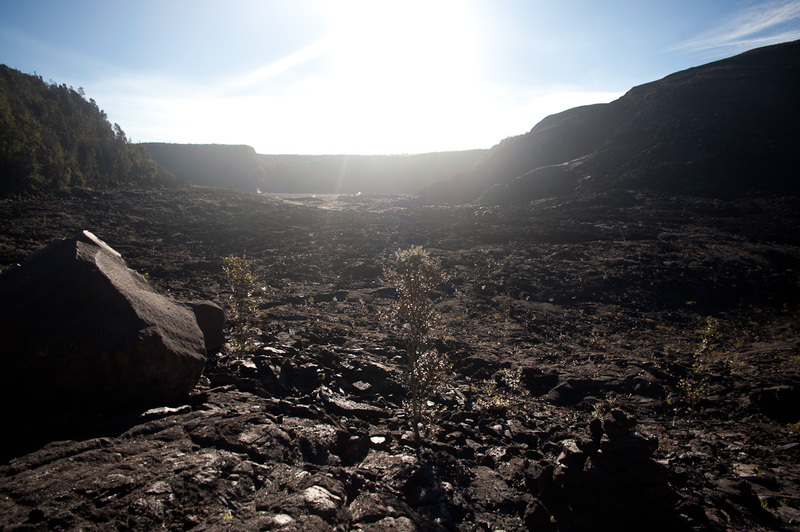 The light illuminated lava fields all around us, and a dry, hot-looking landscape. We picked up a Mazda 3 from Enterprise Rent-a-car, and I took a few minutes to empty out a burst bag of quinoa from the suitcase before driving south. This is a car-oriented place. The roads on this part of the Big Island are wide and thick with cars, most of them far larger than ours. Not much, if anything, is walkable, it seems, which is unfortunate in such a climate. 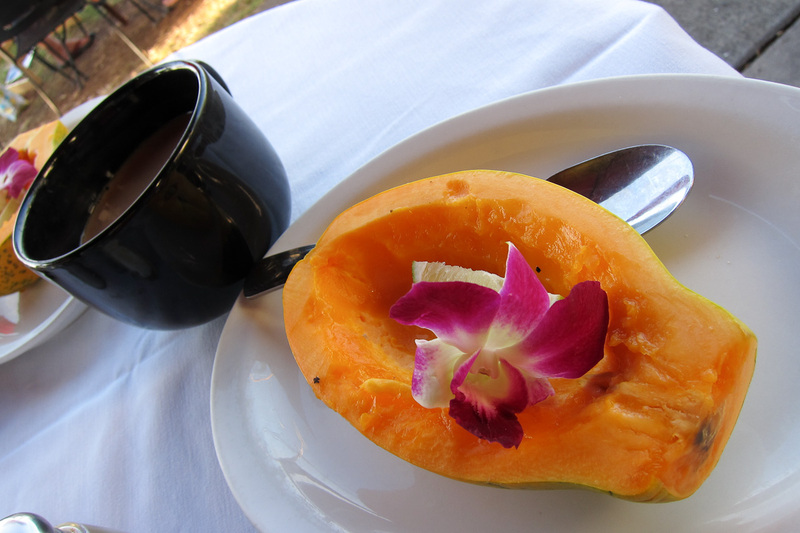 We drove about 20 minutes south to Kailua where we enjoyed a hearty breakfast of eggs, toast, potatoes, Kona coffee, and a tasty half-papaya dressed with lime juice. Our cafe overlooked the water (across a road), and waves rolled in. 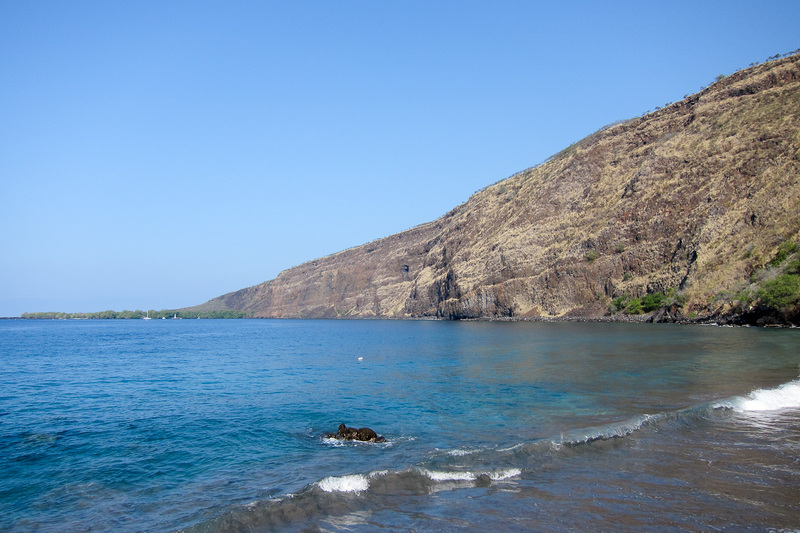 We decided that snorkeling was the best objective for the day, so we drove south to Captain Cook, and hiked steadily down about 1000′ over 45 minutes to reach Kealakekua Bay for some fantastic snorkeling. Just off the lava rocks (and an old temple complex) were clear, warm waters with a great collection of tangs, angel fish, parrot fish, ribbon fish, anemones and corals. It was wonderful to be back in the water again, recalling memories of Sipadan and the Gili Islands. It was busy, mostly from people arriving by boat or kayak, but in the water it didn’t feel too bad. At one point, Kristi got a foot cramp and I had to tow her to shore. Next to the water is a monument to Captain Cook to mark the spot where he was killed by locals after the ill-considered idea to take a chief hostage. The monument, erected in the 1870s by ‘his countrymen’, states that he discovered the Hawaiian Islands. With an attitude like that, I’m sure the Hawaiians felt rather justified in doing him in. The hike back up to the car was hot, passing through old lava flows under the sun, and Kristi, being almost five months pregnant, had to take is slow. I was fine with that. 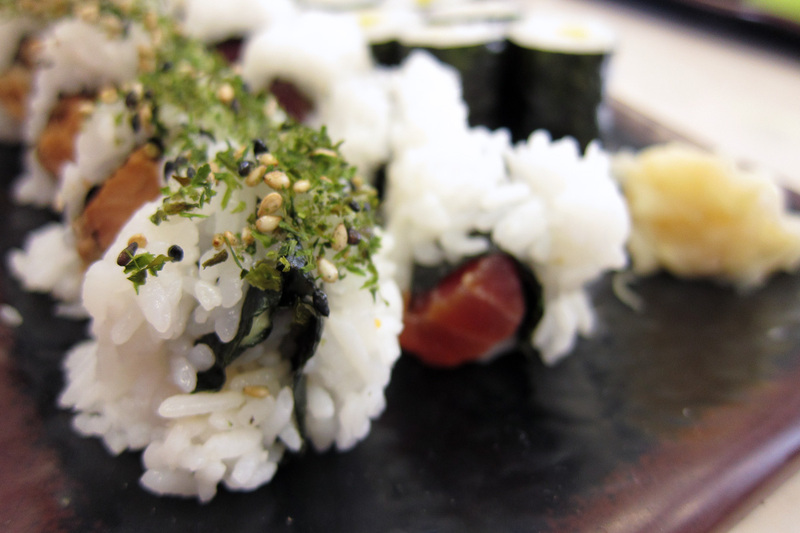 Back in the car, I ate a musubi, a roll of sticky rice with a slice of Spam in the middle, wrapped in nori. Tasty. 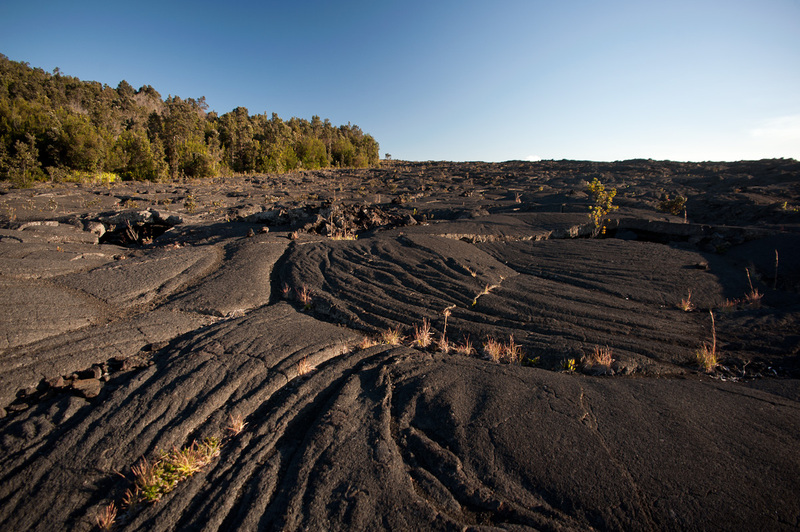 From there we drove north through the hot, dry Kona coast, with scabby lava flanking the road. 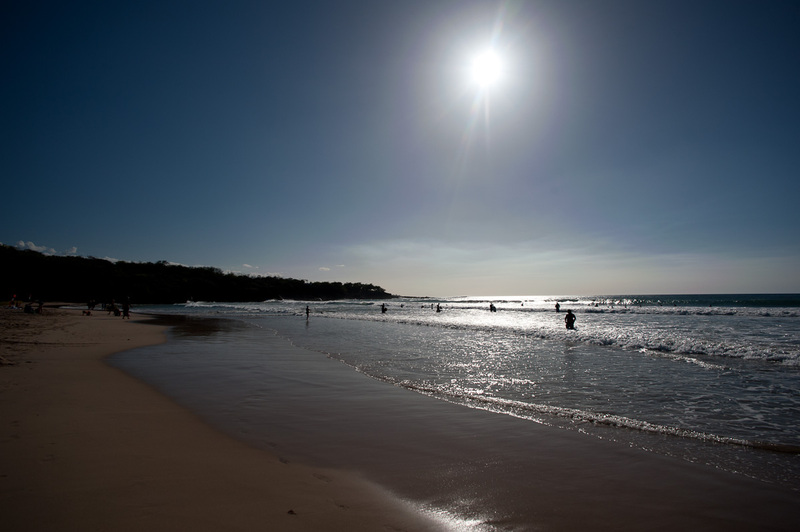 We stopped for a few minutes at Hapuna Beach to watch folks get pounded in the surf in the late afternoon sun, and made a point to return later in the trip. The landscape changed not long after this with an abrupt transition to lush and humid and green as we rounded the north end of the island. We passed through the towns of Hawi and Kapa’au, and dropped down a narrow asphalt track off the road to our lovely cottage. We found this place on-line, and fortunately there had been a cancellation in the window we wanted. The fellow who owns it is a carpenter and this is his show-piece, full of beautiful but not ostentatious details. It has an open vaulted ceiling with visible beams, a polished and dyed concrete floors, lots of built-in storage, an open kitchen, and the amazing 200 square foot screened-in porch, or lanai. The cottage sits in a lush ravine among all the trees I mentioned, and pleasant breezes blow through. It rained hard last night, but we had the the windows open and the skylights cracked so we could hear the waves of heavy rain that came through. Tired from our very long day, we slept like sacks of rocks. Kristi made a great fruit salad drizzled with lime, all from the property, for breakfast. At the end of the road about a 10 minute drive from here is the Polulu Valley. 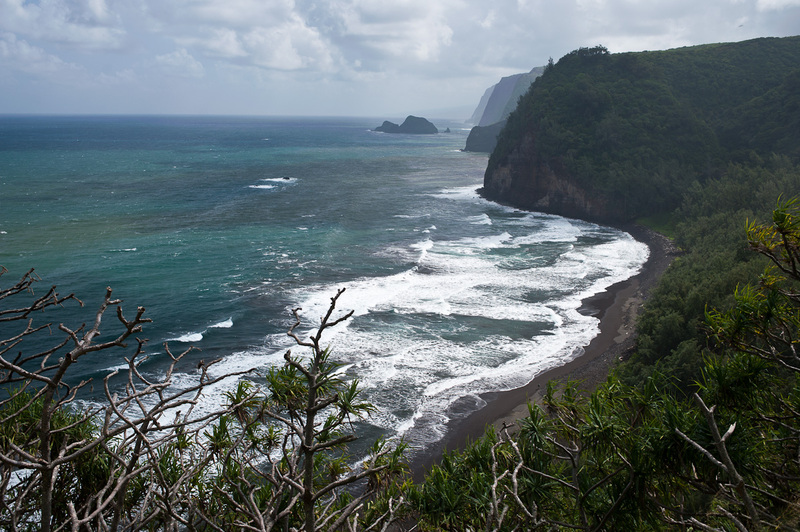 We drove out just for a look, since the weather was still a bit patchy, but the deep valley heading inland, and the line of tall sea cliffs heading into the distance was so spectacular that we decided on the spot to hike down to the black sand beach at the head of the valley. It ended up being an easier hike than we imagined; probably only about 20 minutes down. We walked on the beach and sat on a log watching the big breakers roll in. 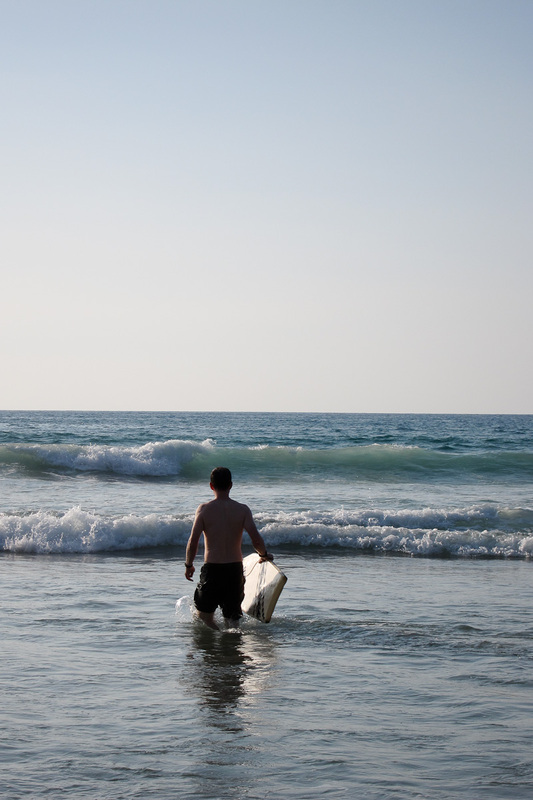 We let the tail ends of the waves lap over our toes. We felt the warm sun and warm breeze on our faces. The hike back up was easy after yesterday’s longer slog. We spent the early afternoon looking around Hawi and Kapa’au, which are pleasant little town with nice old wooden buildings. 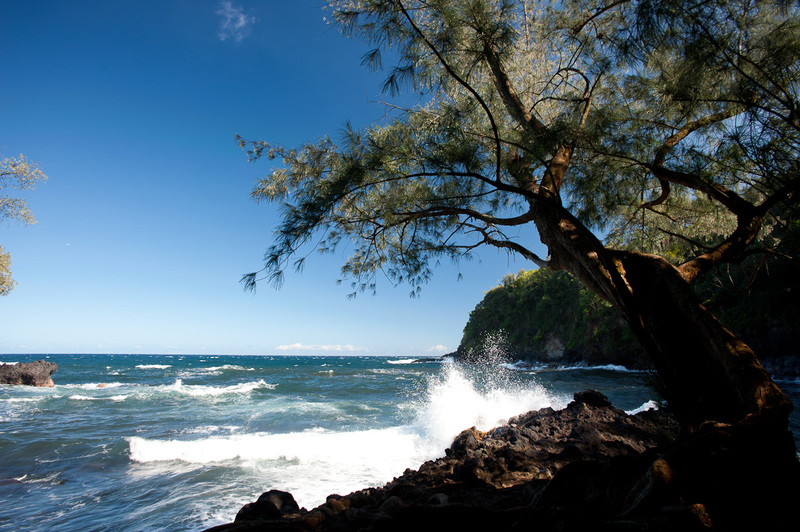 They are touristy, of course, but nothing like the Kona coast. After a fruit smoothy we returned to the cottage then spent the balance of the after noon just relaxing. It feels good to be here. 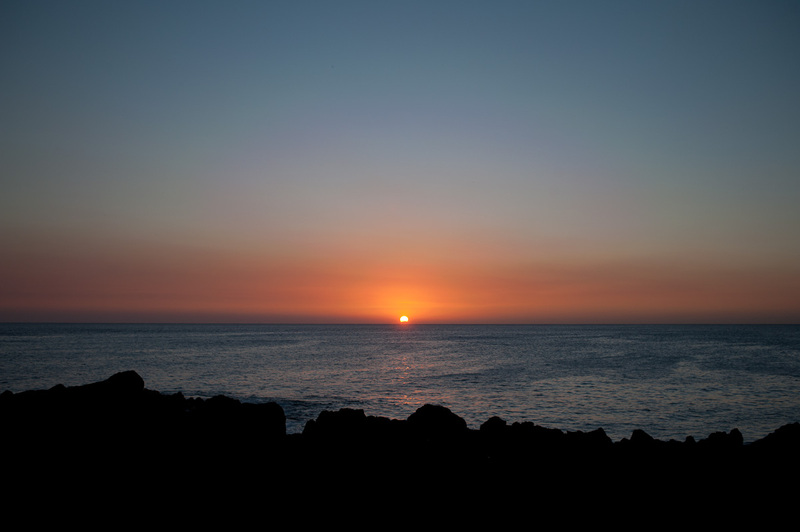 Flying five hours for a holiday is indulgent, but there is a richness to the Big Island that is worth experiencing, and I’m excited about the days ahead. I’m already feeling like there might not be enough of them before we have to go.